As the days the chilly winter are moving away from us and the spring has started to peek from the corners, the hearts are getting brighter with the delight of the summer season. The change in the season brings warmth and freshness for us all and asks a lot for the parent to do. Being a parent is a full time job and to welcome the new season you need to be fully equipped. While the eating habits and the sleeping trends of your little baby girl are going to change in the summer season, so would be the fashion alter for her. Now you have to say good bye to all those furry jackets and vest and welcome the new season with strapped frocks and sandals. The amount of clothes we have for the kids never reaches a satisfactory level and we want to have everything for them at our place. Since the new season is arriving, you need to shop in time so that your child can wear the most appropriate clothes all the time. The general trend across the country is that the summer and spring clothes are comparatively economical to manage as compared to the winter ones. So if you have saved up a little to shop for your baby girl, you can enjoy shopping a good amount of clothes for her. 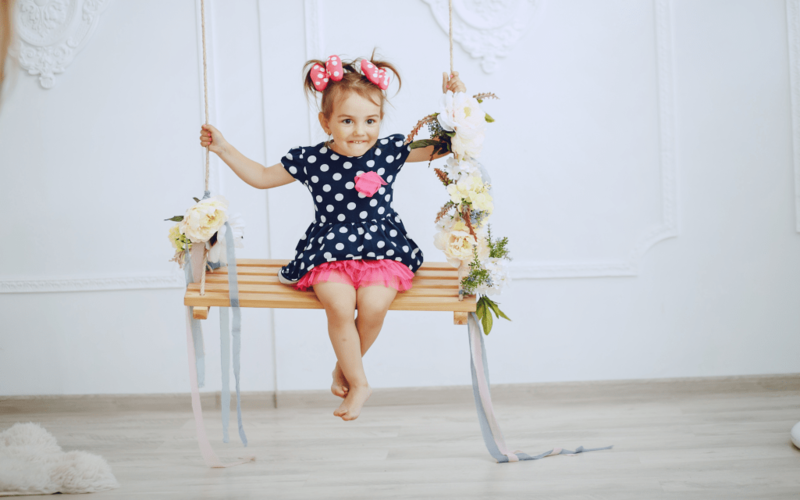 Here we have gathered some top ideas to dress up your little girl and make her look not only beautiful but also unique from all other kids. If you are having some family gathering getting near or if it is a birthday party you need to attend with your little baby girl, then the best thing would be to pic a sleeveless frock that is going to rock the party. But remember that such frocks suits only to the baby girls who can at least sit on their own or can walk a little. If your baby is too little for this, such a frock would not be suitable. Accessorize the girl best with the jewelry and shoes that match the frock and a headband is going to complement the best. If it is some casual routine dress up for your little baby girl then the denim is going to serve the purpose best. The denim for the girls this little, come in a huge variety. You can go for a skirt that goes with a white or a fancy top, you can pic a jumper suit for the girl and it is going to make her look super stylish, go for the tunic and make her look like a little princess, denim jeans with a floral light shirt is also very trendy for the little girls. Whatever suits your girl best is what you should pick. And of course you will pick the stylish flip flops or sandals to go well with her dress. If you are looking forward to dress up your little baby girl in something extremely comfortable for the child yet you want to add style to it as well, then here we are to tell you about the stylish bodysuits. These bodysuits serve best for keeping the child covered while the tulle and the frills on the suit make it look fancy at the same time. You can make use of the pre-walker shoes for the baby and put a lovely headband on her to make her look elegant and beautiful. There is no end to the options for the little baby girl dresses as you can find the comfortable trouser shirt suits for them as well. The babies look very beautiful in these trouser shirts especially the ones that have some creative text written on them. You can also get the text customized for your little baby girl. For example, some text showing your love for the kid, her love for you both or some funny little text to make everyone smile on the little mischief maker. So these are our ideas for the baby girl dresses and vestido infantil para festa,there are surely several more options out there for you. Just keep this in mind that whatever dress you are picking for the baby, it should suit him. There is no need to get discouraged if a certain tone does not go well with the child for each of the baby is unique in his own way and you have to be wise enough to pick the colors according to her.